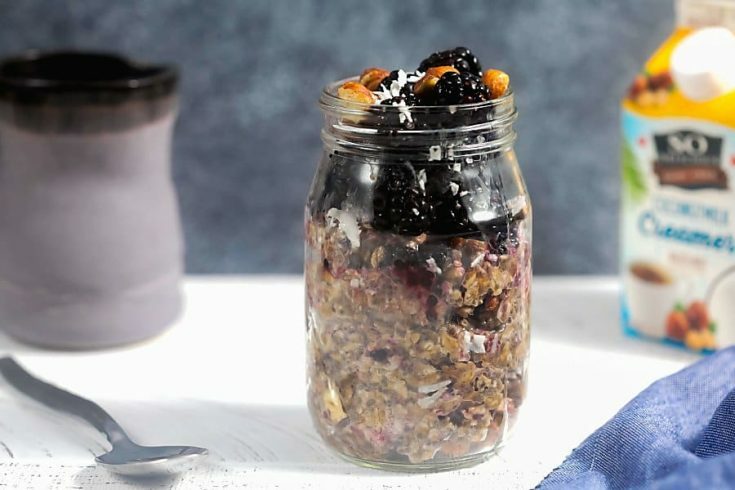 Blackberry Hazelnut Overnight Oats (5-Ingredient Recipe!) | Healthy. Delicious. Overnight oats are an easy, make-ahead breakfast perfect for busy mornings. This blackberry and hazelnut version is a luxurious (and vegan!) way to start your day on the right foot. 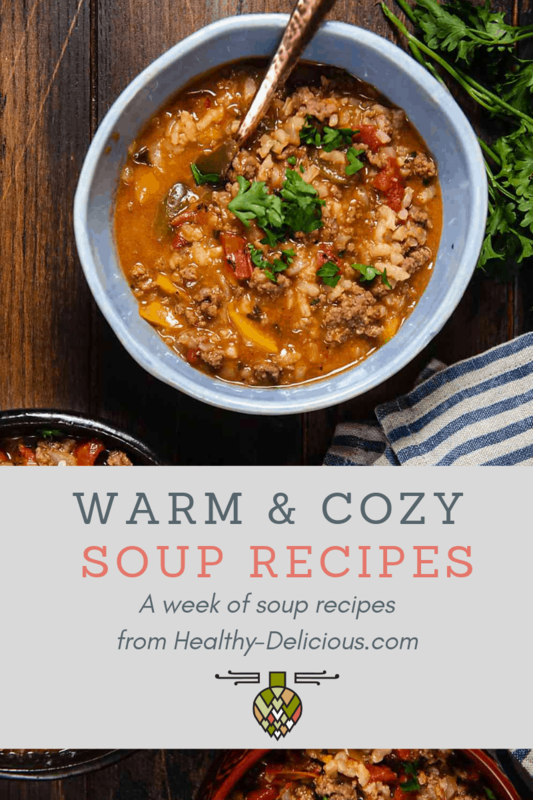 Thank you to So Delicious Dairy Free for sponsoring this post. As always, all thoughts and opinions are entirely my own. It took me a while to get into the idea of overnight oats. I’ve never been a huge fan of oatmeal – I was a total cream of wheat girl growing up – and eating it cold, raw oats just didn’t sound good. That is, until one day when I was making my favorite oatmeal cookies and eating the raw dough like it was my job. In that moment, I realized that raw oats were probably something I could get into after all. Now I’m 100% on the bandwagon. The oats are thick and doughy – not quite the same as eating cookie dough, but also not as gloopy as traditional oatmeal – and the flavor options are endless. I also love that I can make a big batch and divide it up into smaller jars for grab-and-go breakfasts. I grab a jar from the fridge, eat it slowly while I catch up on the news, and feel like I’m starting the day doing something nice for myself. And, as it turns out, cold oats are actually delicious. But on cold mornings or when you want something a little different, you can totally stick them in the microwave and have a hot breakfast. Most overnight oat recipes call for a combination of yogurt and milk, which provides a thick creamy base and enough liquid to hydrate the oats. To keep this version dairy-free, I swapped out the yogurt for mashed banana and chia seeds. 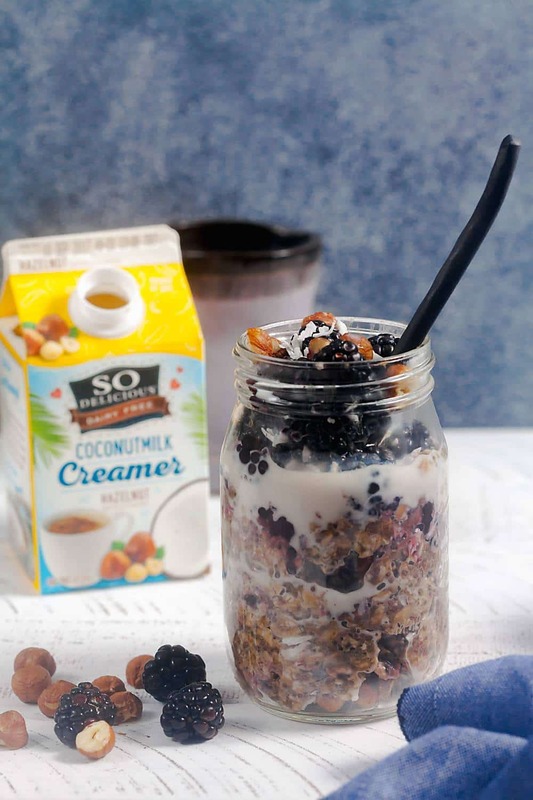 I also added some So Delicious Dairy Free hazelnut creamer, which has a thicker, more luxurious texture than milk and the added benefit of infusing the oats with tons of flavor. A little bit of this creamer goes a long way! Plus it’s sweetened with cane sugar, so it adds plenty of sweetness to the recipe. 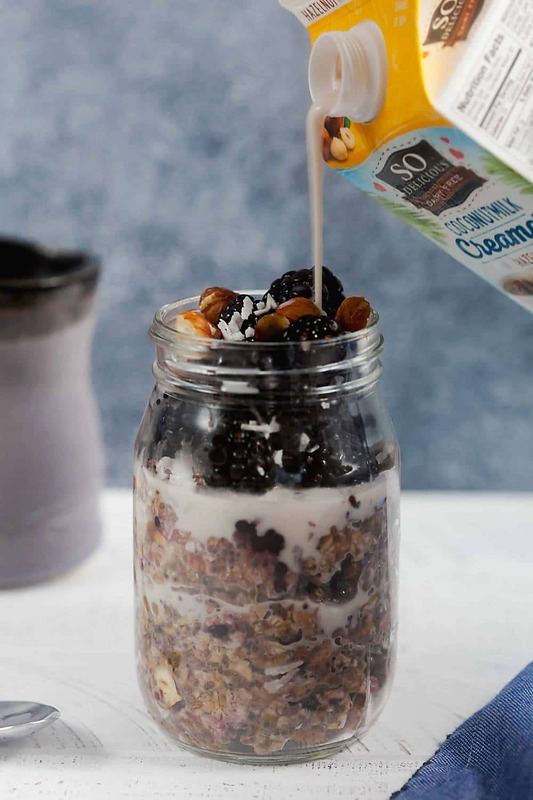 You can add a splash of creamer to the top of your oats for good measure (this is also a good idea if you choose to heat your oats, since it will add more moisture to the mix and help them loosen up a little). 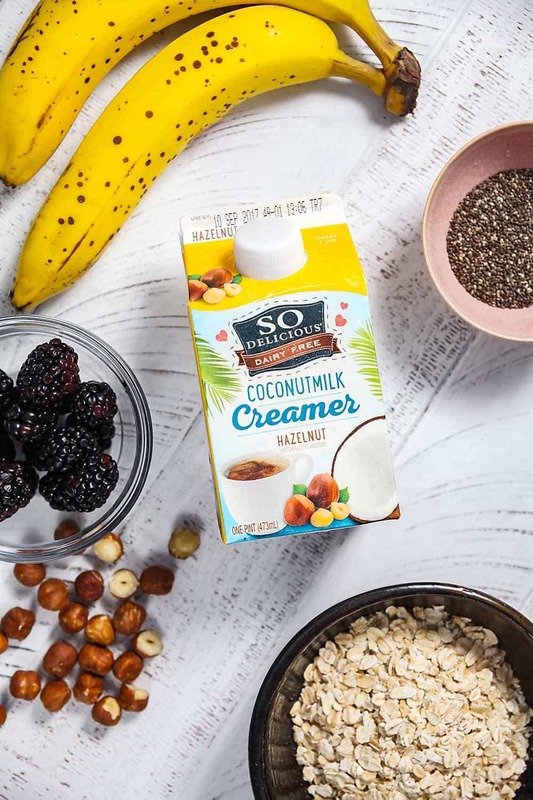 Pop on over to the So Delicious Dairy Free site to learn more about their products (I also love their coconut milk and their frozen desserts, and I’m dying to try their coconut cocowhip!) and snag a coupon. To make these overnight oats, start by mashing two bananas until they’re smooth. Stir in some chia seeds (these will help everything gel up), hazelnut creamer, and rolled oats. I also like to add a pinch of salt to help balance out the sweetness. 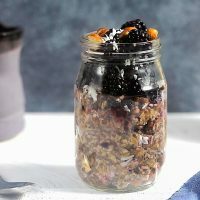 At this point, you can leave everything in one bow or divide the oats into four small jars for easy transport – it’s up to you and you can do whichever makes more sense for your morning routine. Now comes the hard part – waiting. Cover the oats and stick them in the fridge overnight so they have time to soak up all of the liquid and get nice and thick. You can eat them just like that, or top them with more berries, chopped hazelnuts, and shredded coconut. Stir in the creamer, chia seeds, oats, and salt until combined. Gently fold in the blackberries. Divide the oats between four small jars. Cover and refrigerate at least 4 hours, or overnight. 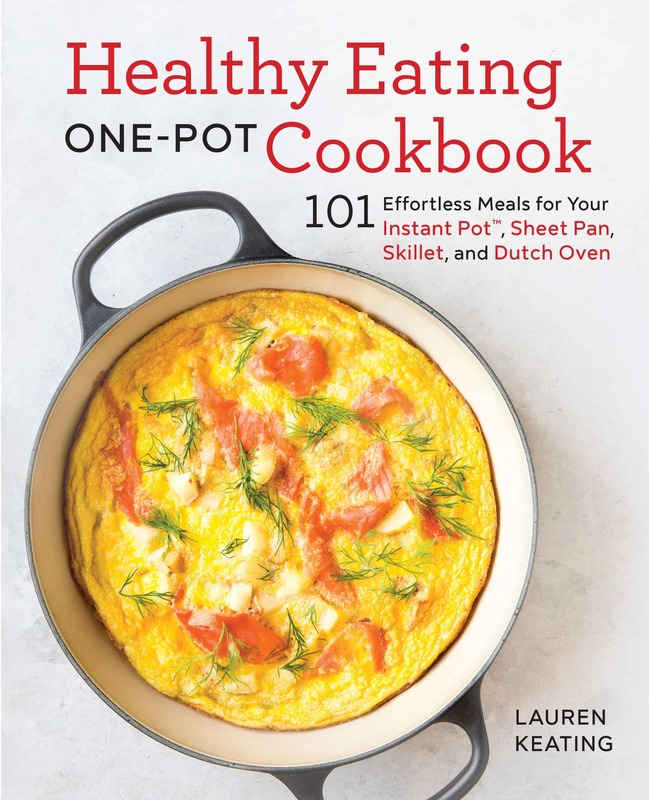 Serve cold, or heat the oats gently in a saucepan or the microwave. Top with blackberries, chopped hazelnuts, coconut flakes, and/or a splash of hazelnut cream, as desired. 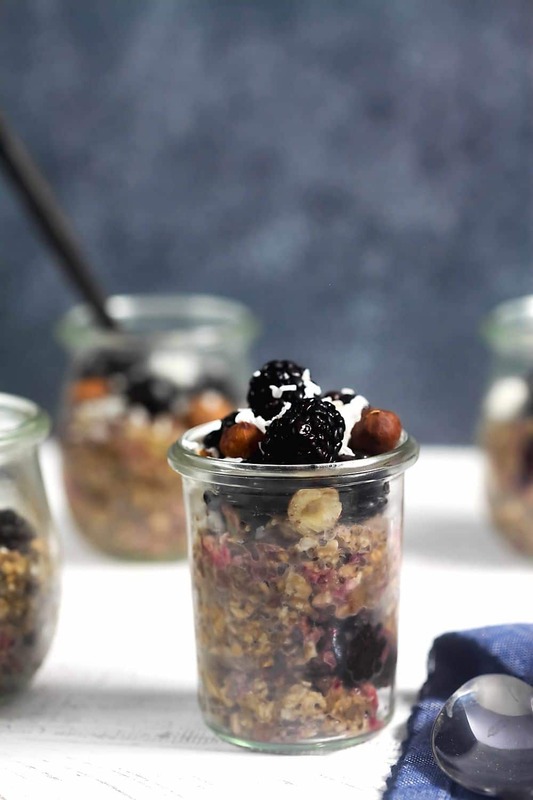 Be sure to use frozen blackberry in these oats, not fresh. The additional liquid that releases when they defrost will help the oats soften. Fresh berries can be used as a topping.